Non-comic fans who frequent social media were probably confused about all the talk of two Captain Marvel movies in the early months of 2019. Surely Marvel Studios’ Captain Marvel, the only film to have that title, was the only one. Right? Technically, no. Captain Marvel actually predated Marvel Comics’ version by a couple of decades. Following the success of National Comics’ (the precursor to DC Comics) Superman and Batman characters, other publishers began throwing their hats into the superhero comic market. Fawcett Publications entered into the game in 1939 and tasked writer Bill Parker to come up with several heroic characters for their debut issue, originally titled Flash Comics. Amongst his ideas, Parker created a team of six heroes that embodied the power of one of six mythological figures. Executive director Ralph Daigh decided that the six heroes should instead be combined into a singular one that could utilize each ability. Parker then created Captain Thunder, who was designed and illustrated by staff artist Charles Clarence “C.C.” Beck. Beck based his appearance on popular actor Fred MacMurray and rendered him in an almost cartoony style that became his trademark. In the fall of 1939, Fawcett published a low-print run ashcan of their book for advertising purposes and to secure the trademarks. The issue was titled both Flash Comics and Thrill Comics. However, Fawcett soon discovered that it couldn’t trademark either title or “Captain Thunder” as all of them were currently in use. The book was then retitled Whiz Comics (after Fawcett’s earliest magazine, Captain Billy’s Whiz-Bang) and artist Pete Costanza suggested renaming the good Captain as “Captain Marvelous”. The editors liked the name, but decided to shorten it to “Marvel”. 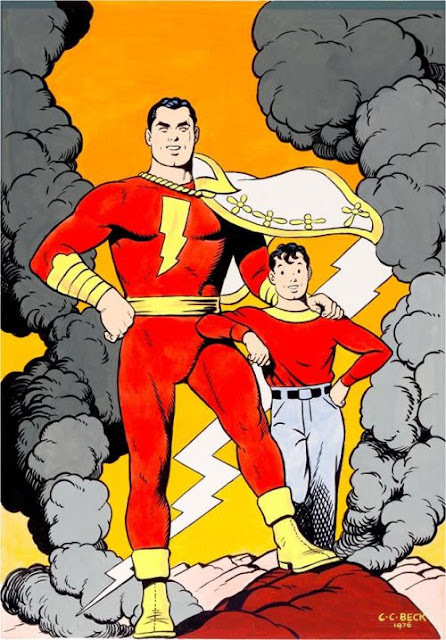 Captain Marvel is the alter-ego of 12-year-old orphan Billy Batson (named after Fawcett founder Wilford H. Fawcett, nicknamed “Captain Billy”) who was granted power by the ancient wizard, Shazam, to continue his fight of good against evil. By speaking the wizard’s name, Billy gained an adult body with the wisdom of Solomon, the strength of Hercules, the stamina of Atlas, the power of Zeus, the courage of Achilles and the speed of Mercury. When not carrying on the fight for justice, Billy served as an on-air radio reporter for station WHIZ. C.C. Beck's rendition of Captain Marvel and Billy Batson. Captain Marvel proved to be a success. Whiz Comics #2 sold over 500,000 copies, and the character steadily grew to become the most popular character in the Golden Age of Comic Books; eclipsing even Superman. In 1941, he was spun off into his own solo title, Captain Marvel Adventures, and was gradually given a supporting cast that shared his abilities. 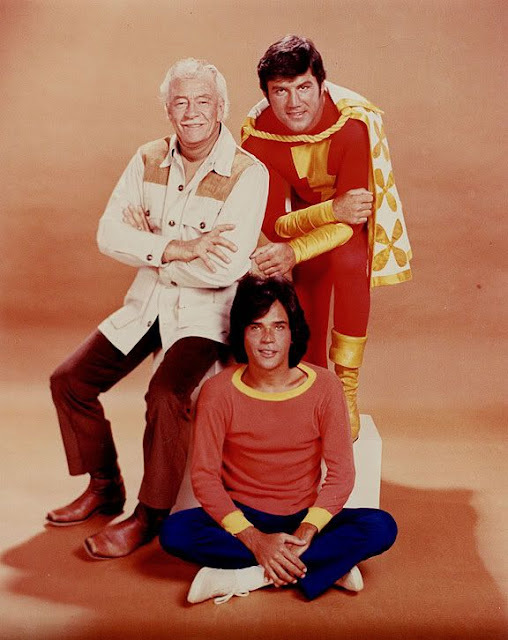 Amongst them were the Lieutenant Marvels, a group of three boys from around the country that shared Billy’s name (and were all based on members of the staff); Captain Marvel Jr., who was disabled newsboy Freddy Freeman; Mary Marvel, Billy’s twin sister Mary; Uncle Dudley, a con artist who ingratiated himself with the Marvel family and they allowed to pretend shared their powers as Uncle Marvel; and Hoppy the Marvel Bunny, an anthropomorphic animal parody. 1941 also saw the debut of the Republic Pictures serial, Adventures of Captain Marvel, making him the first superhero to be depicted in film (portrayed by Frank Coghlan,Jr. and Tom Tyler). A radio serial would follow in 1943 starring Burt Boyar. Battle of the Supermen! Superman faces DC's version of Shazam, Captain Thunder. Unfortunately, success came with a price. National took notice of the similarities between Captain Marvel and Superman—his basic powers, mild-mannered reporter alter-ego, overall appearance—and decided to take Fawcett to court for copyright infringement. The suit went to trial in 1948 and while Fawcett was found to be infringing, the presiding judge discovered National failed to copyright several of their Superman newspaper strips and thus abandoned the copyright. National filed an appeal on the decision and it was found by Judge Learned Hand that while the character itself was not infringing, the specific stories and super feats could be and would need to be reexamined at a retrial. Since the end of World War II, sales on comics had been steadily declining, and instead of prolonging the fight Fawcett decided to just settle the matter out of court. 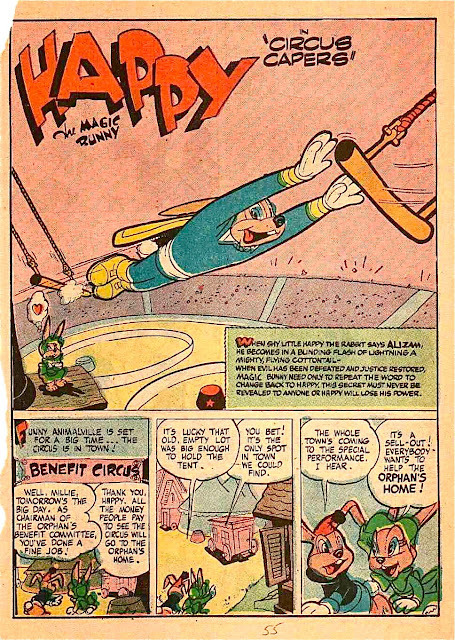 A page from Charlton Comics' Hoppy reprints, with a renamed and recolored Hoppy. Part of the settlement was that Fawcett would cease publication of the Captain Marvel family of titles. However, Fawcett decided to ultimately cancel all of their comics and shut down their entire comics division in 1953. 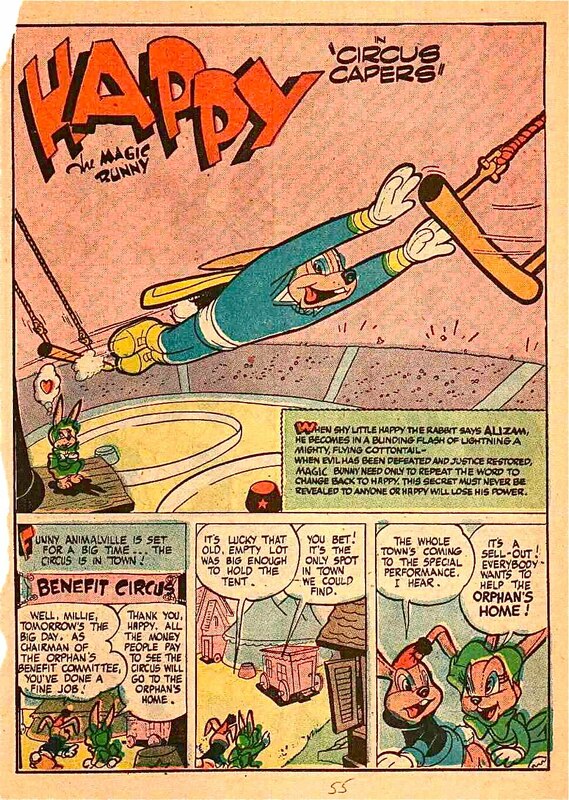 Fawcett sold the reprint rights for Hoppy to Charlton Comics, who renamed him Hoppy the Magic Bunny (sometimes also called "Happy" or "Speedy"), and L. Miller and Son, a British publisher who published black and white Captain Marvel reprints, decided to save their comic book business by adapting Captain Marvel into the derivative superhero, Marvelman. Superman shows no hard feelings as he unveils Captain Marvel's new book. Captain Marvel sat out the next two decades, missing the resurgence of superhero comics. Carmine Infantino, publisher of DC Comics, wanted to inject new properties into their comics line and licensed the Fawcett characters in 1972. 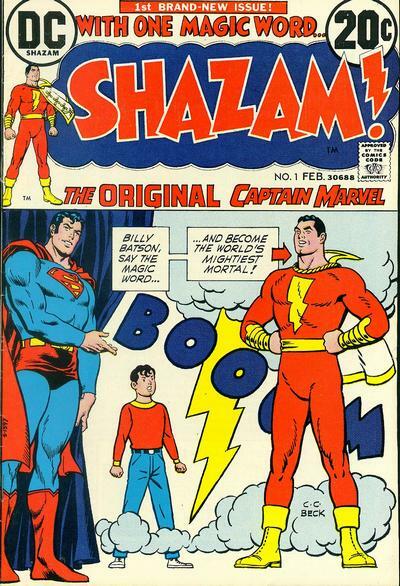 Because rival Marvel Comics had created their own Captain Marvel to secure the name’s trademark in 1967, DC’s revival comic was retitled Shazam! The book maintained the same continuity with Fawcett’s publications and included reprints of those stories. The new content was said to take place on Earth-S of the DC multiverse; keeping it separate from its main line. Beck was brought back to draw the first ten issues before leaving over creative differences. 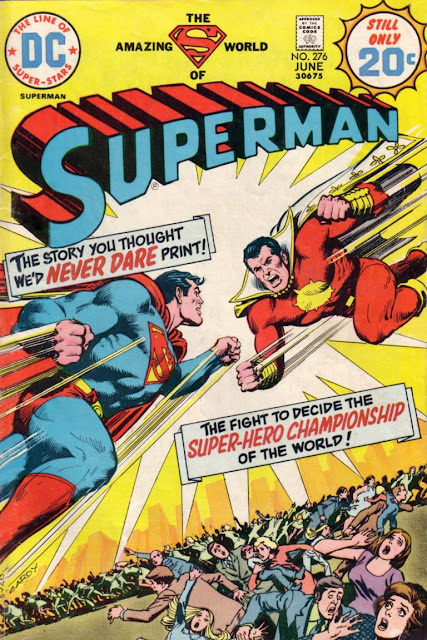 Although the book had a strong debut, it couldn’t match the popularity the title once had (largely due to DC’s inability to advertise it using the “Captain Marvel” name) and it ended in 1978. Further appearances of the Marvel family came as back-up features in other titles. DC also resurrected the Captain Thunder name for a one-off pastiche version of Captain Marvel in Superman #276. Publicity shot of Gray and Bostwick. In 1974, Filmation Associates acquired the license from DC to produce a live-action series based on the character; their first time doing so. Like most other 70s action shows, the series followed Billy Batson (Michael Gray) as he traveled around in a RV with his mentor, Mentor (Les Tremayne), encountering a rotating roster of guest-stars that required help. 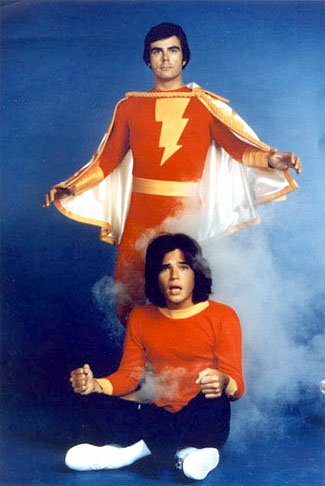 If Billy or Mentor weren’t enough, then Billy would exclaim “Shazam!” and transform into Captain Marvel (Jackson Bostwick) through a stock transformation sequence. As with other superhero shows of the era, there were never any supervillains featured. Instead, Captain Marvel was called upon to deal with drug dealers, car thieves, runaway kids and a host of other relevant social issues. In keeping with their pro-social stance, Filmation included a short segment at the end of each episode where a character (usually Marvel himself) would relay the overall moral for the story. Billy’s job as a radio reporter was only briefly mentioned and never seen. Billy consults with the elders. 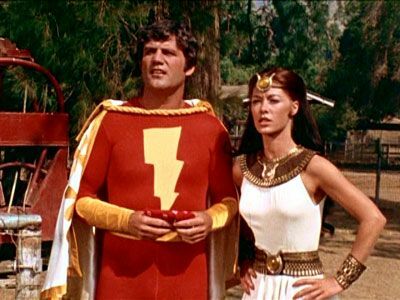 Unlike in the comics, Billy didn’t get his powers from the wizard Shazam, but rather from the six beings that made up his powerset: Solomon, Hercules, Atlas, Zeus, Achilles and Mercury (voiced by producers Lou Scheimer and Norm Prescott, as well as writer Marc Richards and an uncredited cameo by Adam West). The six elders would also request an audience with Billy through a device called the Eterni-Phone in the RV, and after uttering “Oh, Elders, fleet and strong and wise, appear before my seeking eyes!” Billy would be brought before them (represented by animated characters with limited movement). There, the elders would deliver a cryptic message that wouldn’t make sense to Billy until he encountered that day’s problem. CBS Saturday morning ad for 1974. Shazam! debuted on CBS on September 7, 1974. The series was written by Len Janson, Chuck Menville, Marianne Mosner, Jim Ryan, Bill Danch, Bill Canning, Rik Vollaerts, Jack Mendelsohn, Jack Kaplan, Donald F. Glut, Arthur H. Nadel, Paolo Orsini, Barry Greenfield, Frank Grenville, Michael Pressman, Olga Palsson Simms, Michael Sutton, Sid Morse, J. Michael Reaves, Ray Goldstone and Susan Dworski. The music was composed by Ray Ellis and Prescott (as Yvette Blais and Jeff Michael, respectively). In a 2012 interview, Gray recalled that the show was filmed a short distance from the studio and they completed an entire episode within two and a half days. New publicity shot of Tremayne, Gray and Davey. Shazam! became a hit for the studio and the network. Emboldened by their success, Filmation created another superhero show starring an original creation: Isis (Joanna Cameron). The Secrets of Isis became the first with a female superhero lead character and was paired with Shazam! to form The Shazam!/Isis Hour. Isis and Captain Marvel would also cross over into each other’s shows as a result. During production of the second season, Bostwick, who performed most of his own stunts, was injured and was instructed by his doctors to take a few days off from filming. Producers somehow got the idea that this was a tactic to get a pay increase and promptly fired him. They felt no one would notice a change and replaced him with John Davey. Bostwick only appeared in two episodes of season two, while Davey appeared in the remainder. Bostwick sued Filmation for wrongful termination and Filmation was forced to pay his full salary for the entire series, as well as residuals for reruns. 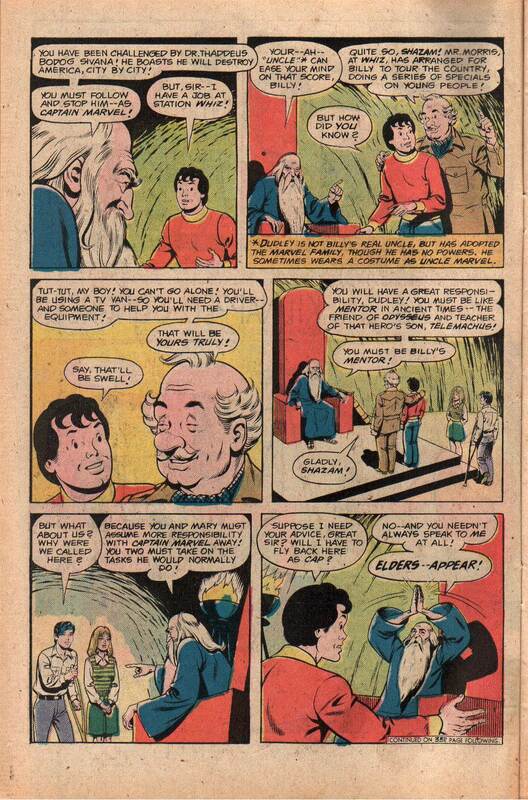 Billy gets new instructions in Shazam! #26 by Nelson Bridwell & Kurt Schaffenberger. To tie into the program, DC altered the direction of their comic beginning with issue #25, which introduced Isis into the DC Universe. The next issue, Uncle Dudley was reintroduced with a new mustache and was assigned the role of Billy’s “mentor” by the wizard Shazam. He was to accompany Billy in an RV as he used the cover of being a roving reporter to pursue his arch-nemesis, Dr. Sivana, and prevent him from destroying the country city by city. 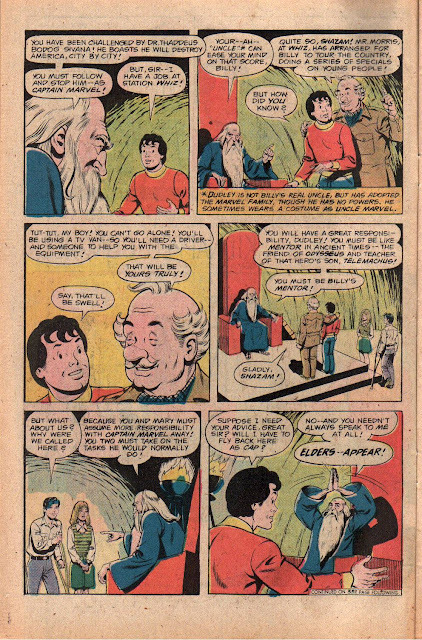 Shazam also gave Billy access to the six elders to consult with whenever he needed guidance utilizing the Eterni-Phone. By the time of the comic’s final issue, which was published two years after the show ended its third and final season, the status quo was reverted back to normal with Captain Marvel working alongside the Marvel Family. 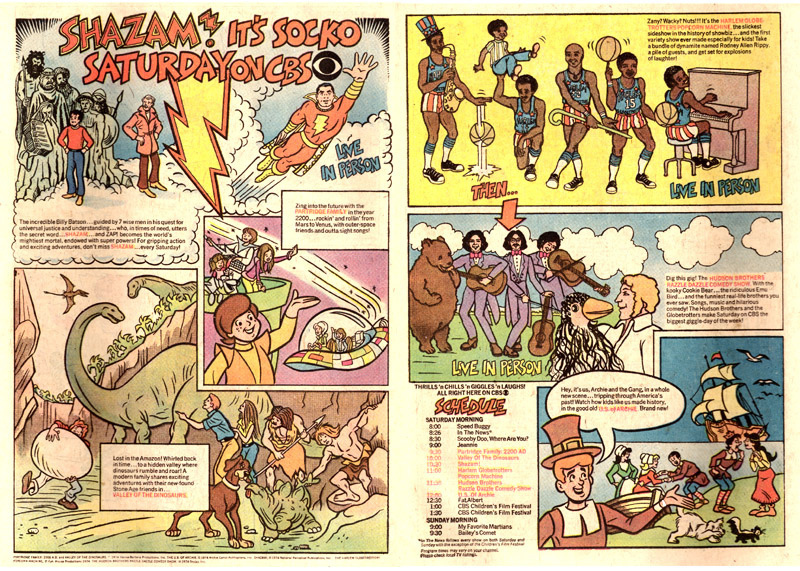 The art style was also changed from a Beck-influenced one to be more representative of what was typically found in standard superhero comics. Following its conclusion, the show was seen in reruns on both the network and later across various cable channels. By 1991, DC purchased the rights to the character outright and the show fell under the ownership of Warner Bros.; DC’s parent company. In 2005, Warner Bros. Television released “The Joy Riders” on the 8th volume of their Warner Bros. Television Commemorative DVD series that was released as bonus disks with various Warner releases. It was designed to tout the 50 years of Warner Bros. Television as well as promote their programs that didn’t have their own home releases yet. The episode was also included as a special feature of Wonder Woman: The Complete 3rd Season. The rights to Isis remained with Filmation’s successors, however when the complete series was released to DVD in 2007 the set included the three crossover episodes with Captain Marvel. In 2012, Warner Archive released the complete Shazam! series to DVD. The series was also made available for streaming on the iTunes Store and the DC Universe service. “The Joy Riders” (9/7/74) – A young man doesn’t know what to do about his friends stealing cars for joy rides. “The Brothers” (9/14/74) – Made to feel useless because of his brother, the blind Chad runs away only to have his brother pursue him and end up bitten by a rattlesnake. “Thou Shalt Not Kill” (9/21/74) – A woman’s niece tries to prevent the destruction of a horse as requested in the woman’s will. “The Lure of the Lost (Part 1 of 2)” (9/28/74) – Billy and Mentor try to help Gary get himself away from the influence of a drug dealer. “The Road Back (Part 2 of 2)” (10/5/74) – The drug dealer steals the police car that holds Gary to prevent him from going to the DA’s office with evidence against him. “The Athlete” (10/12/74) – Two boys will stop at nothing to keep Kellie from being part of the all-boys Varsity Team. “The Treasure” (10/19/74) – Billy and Mentor try to help stop the theft and sale of priceless Indian artifacts. “The Boy Who said No” (10/26/74) – Mentor is robbed, and the young boy who witnessed it is warned off from confessing by the robber. “The Doom Buggy” (11/2/74) – Don dropped out of school to work but soon discovers he’s not as smart as he thought he was. “The Brain” (11/9/74) – Billy and Mentor try to help new kid Jim get accepted by his peers, and a tough guy decides to use that to talk Jim into a dangerous stunt. “Little Boy Lost” (11/16/74) – Billy finds and saves a boy who runs away, and he and his father soon pay it forward by trying to rescue a puppy that fell down a well. “The Delinquent” (11/23/74) – Even though Norm can’t swim, he decides to go on a canoe ride and ends up capsized. “The Braggart” (11/30/74) – Braggart Alan ends up having to prove he did a dangerous stunt or else risk losing his friends. “The Past is Not Forever (Part 1 of 2)” (12/7/74) – Jackie is accused of robbing the gas station he works at due to his criminal records and the use of the keys in the crime. “The Gang’s All here (Part 2 of 2)” (12/14/74) – Vinnie’s desire to get even with Jackie almost results in one of them being killed at the oil refinery. “On Winning” (9/6/75) – Corky feels he can’t compete with his brother and his father doesn’t love him as much because of it, so he decides to run away. “Debbie” (9/13/75) – Billy has to help make Debbie realize when her parents warn her off certain things it’s out of love. “Fool’s Gold” (9/20/75) – A group of boys tease an old prospector until they end up trapped in his mine. “Double Trouble” (9/27/75) – Captain Marvel is framed for a crime and turns himself in to the police, leaving Mentor to try and clear his name. “Goodbye, Packy” (10/4/75) – Kathy doesn’t want to set her aging wolf free, so she runs away with him and hides in a hot-air balloon. “Speak No Evil” (10/11/75) – When a boy confesses to accidentally setting the school on fire, his fellow culprits chase him into the electrical plant. “The Odd Couple” (10/18/75) – Dan refuses to accept Captain Marvel’s help when his plane runs out of gas, while Captain Marvel needs Isis’ help to stop a forest fire. “The Contest” (9/11/76) – Glen is convinced to steal the answer to a contest for a motorcycle, and the one who convinced him looks for some payback. “Bitter Herbs” (9/18/76) – Yale is kept out of a club because of his faith, but soon the leader of the club finds himself in trouble with a mountain lion. “Ripcord” (9/25/76) – Young Bill, in a hurry to grow up, packs his brother’s parachute by himself. “Finders Keepers” (10/2/76) – Captain Marvel calls on Isis to help him rescue two girls and Mentor from thieves. “The Sound of a Different Drummer” (10/9/76) – Curtis’ friends pressure him to give up the violin and take up sports, causing him to run away and wind up in a missile testing range. “Out of Focus” (10/16/76) – Captain Marvel and Isis have to convince a young filmmaker to give his film to the police so that a pair of thieves can be brought to justice. Labels: 1970s, CBS, comic book, comic book adaptation, Filmation, live-action, Shazam!